Marie Rose Dufour: Release Day is Here!!! 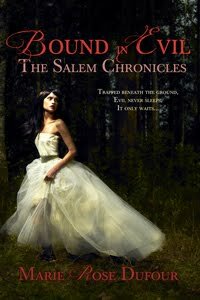 My publishers pushed up my release date, SO IT IS TODAY!!!!!! 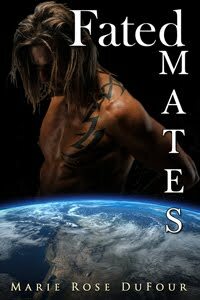 Leave a comment and have a chance to win your very own copy of Fated Mates!!!!! Book Blurb: We know that we are no longer alone in the universe. Descendants of Earthly ancestors have returned to find the other halves of themselves, their destined mates. Dragon leaned back in his office chair gazing unseeingly out the vid-window down at Earth from where the cruiser orbited the planet. His brow furrowed in concentration with the problem at hand. “Uh…hum,” uttered from behind him trying to get his attention. The gentleman should know from experience, he did things in his own time and only when truly ready. “Uh…hum…” again sounded from behind him. Properly chastised, Dragon, confident he would not be disturbed again until he thought through every option, let his eye gaze back to the blue planet below. Ever since first orbit, life hadn’t been the same on his ship. Everyone had been edgy, including him. Expecting, hoping, and praying to be mated to someone on the planet below, everyone except him. He had lost faith in the dream a long time ago. Now he had to deal with a situation he never thought would happen under his command. He adjusted the eye patch he wore over his left eye, a souvenir he received as a POW, before he slowly turned his chair around and pierced the man in front of him with a steely gaze. For the first time during his lecture, he saw his friend blanch at the mention of being shipped home. Sergeant Tarlon simply raised his hand to display the vivid, red scrolling mating mark imprinted across his hand. Dragon’s face hardened and his un-patched eye turned as cold as the wind whipping across the ice plains on the North Pole of Serralia. “Do you intend to soften me by insults and bringing attention to my lack of a mate?” Dragon sprang from his chair and stalked in front of him. Tarlon’s eyes immediately went to the floor in a show of respect. He took a deep breath and looked his friend in the eye. His unintentional insult struck deep, to go through life unmated was a fate worse than death to his people. Dragon sighed. He knew his punishment didn’t match the crime. It went against the very beliefs of his culture to separate Fated Mates even for a moment. Everything changed when Tarlon had shown him his mark. “I am in quite the awkward position, my friend. Your infraction must not go unpunished, but I cannot separate you from your mate. What I can offer you is a compromise. Spend the day portion of your sentence in the detention center catching up on the backlog of paperwork, which seems to have piled up. The night portion of your sentence, you are in the custody of your mate.” Dragon glanced back and caught the brief look of relief crossing Tarlon’s face and something long dead inside hurt until he squelched it. “Regardless, a prayer will be said,” Tarlon whispered as he turned to leave the room. “Yes?” He paused at the door and looked back at the lonely man standing in front of the window. “The yearning call,” Dragon whispered reverently. “Is it as all-consuming as people speak of?” Dragon reached his hand out as if to touch the blue planet in his window, but dropped it so quickly Tarlon probably thought he imagined the action. “More.” With the powerful word hanging in the air, the door closed behind him. Got my copy too! Sou count me out of the contest, but I still wanted to comment to say CONGRATS!!!! Yay, happy euphoric day!